Visit Lake County wishes a happy holiday to everyone and we hope to provide you with to unScrooge yourself this holiday season in Lake County. Let’s face it, there are a collection of bah hum-buggers out in the world. Fill yourself up with holiday cheer in Lake County. Continue here » to learn more. Enter here to win free Six Flags Great America tickets, overnight lodging at Great Wolf Lodge Illinois and a $200 Gurnee Mills gift card. Here are your top 10 holiday things to do in Lake County. Happy Christmakwanzakah Lake County! Preparing for Christmas. Santa takes order. It’s an all-out shopping spree, and of course, Lake County is invited! Black Friday sales may be over, but it doesn’t mean you can’t find stupendous deals throughout the holiday season. From malls to mom and pop shops, Lake County’s shopping options are abundant. Here are a few spots to explore your gift-giving generosity. Do you have Zuzu’s petals? What do ya know about that! Merry Christmas! Everyone’s favorite film starring Jimmy Stewart is coming to the live stage at Antioch’s esteemed PM&L Theatre. This radio show format exhibits what life would be like without town hero, George Bailey as he contemplates suicide on Christmas Eve. “Buffalo Gals” and guys should come out that night and dance by the light of the moon for this holiday classic. Weekends between December 14-23. Tickets: TBA. PM&L Theatre, 877 Main St., Antioch. The United States Navy Band will provide holiday music lovers with their “Sounds of the Season” concert at the Ross Theater. The big man in the red suit even stops by to show off his chops on the ax. The concert is free, and Naval Station Great Lakes encourages audiences to don seasonal attire. Thursday, December 14; 7-8:30 p.m. Naval Station Great Lakes 2601E Paul Jones St., North Chicago. yes ❤️🎄💍 a christmas tree and the love of my life asking me to marry him all on the 1st day of december…what a perfect (freezing cold) day followed by a best weekend surrounded by family. I can’t wait to spend forever with you, @jspecks1507. Create a memory as you and the family embark (or debark) the family Christmas tree at Richardson Farm. Over 50,000 trees are growing on the Spring Grove farm. Richardson also will sell handmade decorated wreaths, garland and will offer a free shaking and bailing of trees. On weekends there are free wagon rides, freshly-made donuts, hot chocolate and other concessions. Through December 23. Richardson Christmas Tree Farm, 9407 Richardson Rd., Spring Grove. Six Flags Great America kicks off their inaugural Holiday in the Park event this year. This festival runs from November 23-December 31 on select days. The new holiday party will transform the park into a winter wonderland featuring millions of dazzling lights, a beautiful Christmas tree (5 p.m. lighting every night), meet and greets with Mr. and Mrs. Claus, festive entertainment and of course, rides on a world-class roller coaster. November 23-December 31; 2-8 p.m. or 2-9 p.m. Six Flags Great America, 1 Great America Pkwy., Gurnee. “Old Marley was as dead as a doornail.” Old Jacob Marley and a cast of other memorable Charles Dickens characters are lined along Main and Lake Streets in Antioch to offer visitors a cheerio to the holiday. This Olde English public art exhibit has around 45 lifelike mannequins spread along the streets displaying over 25 different storylines and acting out different Dickens scenes. Get the “bah humbug” out of your soul with this elegant display. After Dickens’ “spirits of all three shall strive within you” at his wax figure exhibit, mosey on over to Piggly Wiggly’s Plaza across town to experience more of the Christmas spirit. As the night falls in the afternoon, visitors can browse the magnificently illuminated shadowboxes. In its new location now indoors, the scenes in these boxes provides that nostalgia you attained when enjoying downtown Chicago’s Marshall Fields windows. Through January 1. Downtown Antioch. The Holiday Inn is a staple for the holiday season. Featuring brilliant gems from legendary composer Irving Berlin-like “White Christmas,” “Easter Parade” and “Happy Holidays,” this is a story of Jim who leaves the song and dance world. Jim meets a school teacher who is also talented. Realizing their chemistry and talent, they turn a farmhouse into a venue for fantastic performances to celebrate every holiday from Thanksgiving to the Fourth of July. Bask in nostalgia throughout this classic at the Lincolnshire theatre. Select days through January 6; Various ticket prices. Marriott Theatre, 10 Marriott Dr., Lincolnshire. Oh, the weather outside is frightful, but inside Great Wolf Lodge Illinois, the temperature is 84 degrees. The event is full of holiday season activities like visit’s with Mr. Claus, shining, shimmering decorations, Snow ‘N’ Glow Dance Parties, a life-sized gingerbread house and so much more. Book your family vacay now! Through January 4, 2019. Great Wolf Lodge Illinois, 1700 Nations Dr., Gurnee. The Grayslake facility showcases a superbly illuminated show in a drive-thru format. 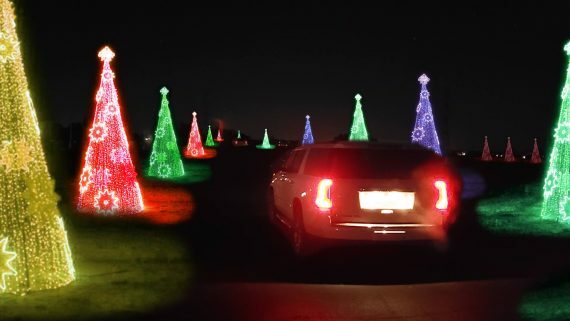 The route is nearly a mile of 1,000 programmable and over 100,000 animated lights synced to holiday music. For other holiday happenings in Lake County continue here. For all events in Lake County click here.